Marcel (known as "ri3s" on Flickr) appears to have a flair for the theatrical. So many of his photos are like frames from an unscripted movie featuring everyday people in real-time drama and off-the-shelf wardrobe. Sidewalks, graffiti-walls and ATMs are the props and stage lighting is by the crafty positioning of a hand held Lumix or D80 camera. Is that all deliberate? "First of all, thank you very much for your words and interest. I am really glad that someone likes my work, I appreciate it. Regarding your question, sometimes when I walk through streets I see scenes and situations and I already frame them in my head, even when I do not have my camera with me at that time. I know places where interesting situations can happen, but I definitely do not plan it when we talk about "street photography". PD: When did this all start for you? Marcel: I started with photography about 2 years ago and from that point, I trained my eyes for some situations. Maybe the way I remember the frames in scenes when I watch movies has a big influence. PD: Sometimes I see a Hitchcock moment in your photos, like "Escape". "It was a great moment when I took that picture, but it was definitely about luck. I named it according to the behaviour of the man and his action. Wen he realised I am taking a picture of him, he tried to 'escape' out of frame." PD: And the graffiti wall, the pigeons, those big pavement stones. They all seem like a movie backdrop. Is that what made the photo-opportunity for you? 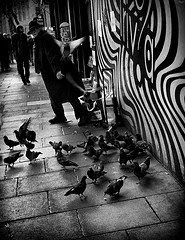 "I liked the combination and the contrast of the graffiti wall, the street itself, the man in the coat, but at the same moment the pigeons. I took a series of pictures - the whole scene - but really the best moment happened as the man ran out of the frame. Kind of drama I would say." "In all cities around the world you can see beggars. 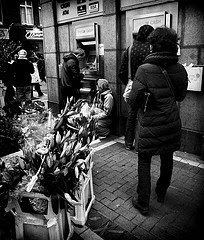 Here in Dublin they are often normal people, able to work (maybe not so lucky to get the job) and they are sitting in the middle of two cash machines - kind of strategy. It is quite interesting, the opposites of two worlds, with some people waiting to pick some money but at the same moment, there's the beggar waiting for some spare change." PD: What does this all say about you? Where will it take you next? "I like contrasts. Social, colour, emotional. For me, the street is like theatre. Too many roles, too many characters, too many destinies, their paths crossing on the street. Taking actions and reactions which are necessary to keep them running through life. I am still trying to find myself in photography. 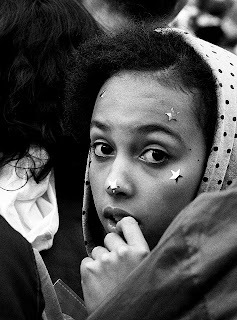 I fell in love with street photography, but now I try to do more portraits, some projects. To bring my skills to another level. To plan the scene. To make it happen." There is one very special portrait in your set, called "In The Crowd". "Another lucky moment. It came alive in the street art competition here in Dublin. I was watching the performance of one guy, and one of the girls standing in front of me was looking my way several times - as if she was probably waiting for someone to show up. It was not possible to miss her lovely face and innocent eyes, so I waited for her to turn around again. This image came out more impressive than I imagined, with her hand and that look.For me it was breath taking".